Offered once a week. 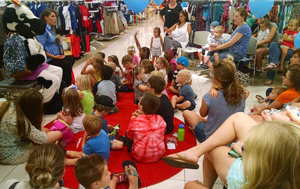 We plan and organize a playgroup at various locations around Alachua County. Fun4GatorKids can bring a playgroup to your location, or you can bring your business to the playgroup. We have over 600 members in our playgroup, but playgroup hosts may limit the attendance or require pre-registration. 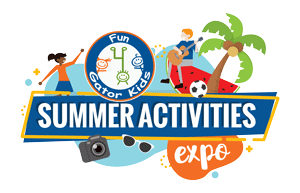 At Fun 4 Gator Kids Summer Activities Expo, kids can learn about and sign up for dozens of area summer camps, swim lessons, and other summer activities to keep your kids busy all summer. Kids can enjoy LOTS of FREE activities like face painting, bounce houses, art projects, STEM activities, putt-putt golf, horseback rides and MORE! Vendors MUST provide a FREE kids activity, or demonstration OR hand out FREE promotional items or FREE trinkets like candy or pencils or stickers. 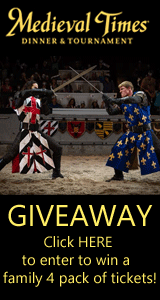 This is the largest event we host, and the most attended family event in Gainesville. Last year, we had an estimated 8,000 people in attendance. Safety related businesses are welcome to register as an exhibitor. All other businesses are welcome to attend as a sponsor. Sponsorship levels range from $250-$1000. * Waived for non-profits and government agencies attending the event with unpaid volunteers. Boo at the Zoo is Gainesville's favorite Halloween treat for families. The students and staff transform the zoo into a spooky but safe trick or treating event for the whole family. Fun4GatorKids hosts the Kids Zone set up in front of The Little School. Expected attendance is 6000+ and all attendees will flow through the Kids Zone after visiting the zoo. We have limited availability for a maximum of 20 booths. *We are not permitted to accept food vendors or dance studios in the Kids Zone. Vendors may provide a kids activity; provide giveaway/promotional items OR may hand out wrapped candy. 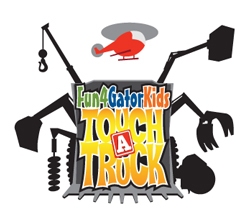 Subscribe to the Fun4GatorKids Event Vendor mailing list to be informed about upcoming vendor opportunities at events hosted and sponsored by Fun4GatorKids.